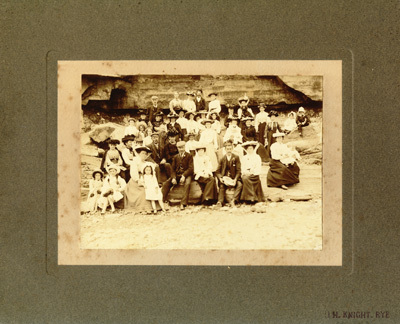 [ABOVE] A group photograph taken by H. Knight of Rye around 1910.Inscribed in pencil on the reverse of the mount are the words "Peasmarsh Outing?" [ABOVE] A group photograph by H. Knight of Rye with the photographer's name rubber-stamped on the bottom right corner of the olive-green mount. 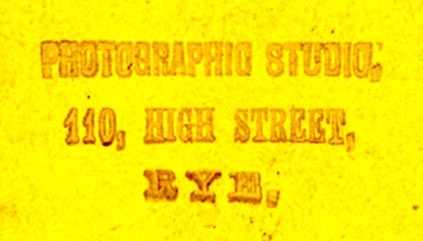 [ABOVE] The name of the Rye photographer H. Knight, rubber-stamped on the corner of the olive-green mount. Dougald Wainwright Leah was born in London on 14th May 1850, the son of John Dougald Leah (1805-1888) and Frances Agnes Dixon (1813-1897). Dougald Wainwright Leah was baptised at St George's Church, Hanover Square, London on 9th June 1850. Dougald Leah worked as a coppersmith and metal worker throughout most of his working life and only turned to photography as a source of income when he was in his late fifties. On 27th February 1881, Dougald Leah , then a twenty-nine year old coppersmith, married Elizabeth Dolbey (born 1854, Walthamstow, Essex) at Teddington, London. The newly-weds settled in North London. 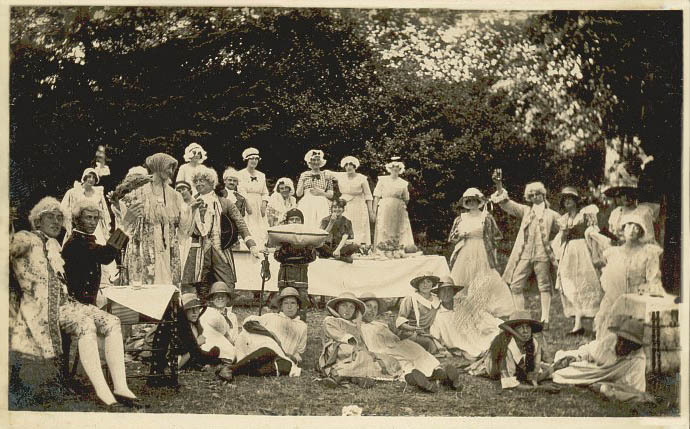 During their long marriage the couple produced five children - Harold George J. Leah (born 1882, St Pancras, London), Harriet Leah (born 1884, Edmonton, London), Percy Dolbey Leah (born 1888, Edmonton, London), Frances Minnie Leah (born 1890, Edmonton, London) and Agnes Elizabeth Leah (born 1893, Edmonton, London). 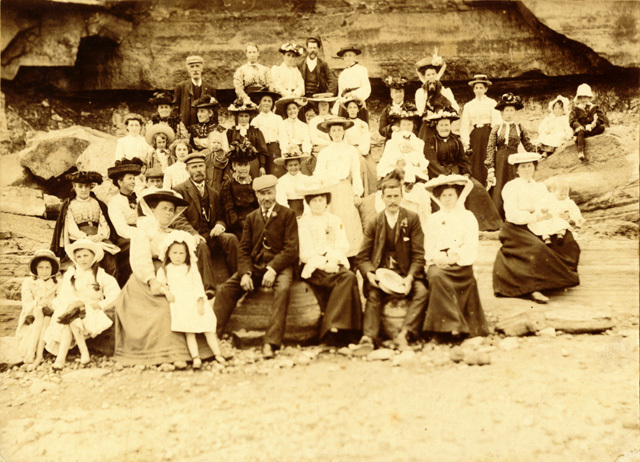 At the time of the 1901 census, Dougald Leah and his family were living in the St Mary-in-the-Castle district of Hastings on the Sussex coast. Both Dougald Leah and his eldest son, nineteen year old Harold Leah, were working as coppersmiths in Hastings. 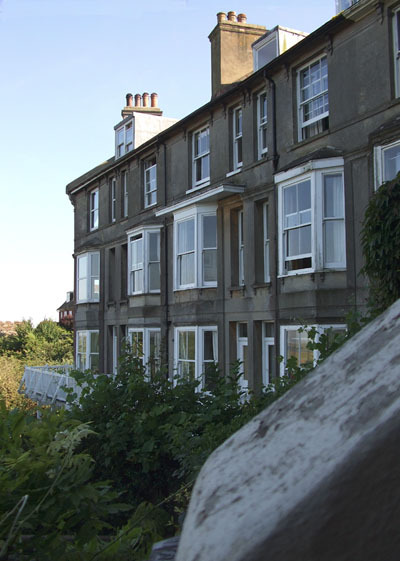 By 1909, Dougald Leah, his wife Elizabeth and their youngest daughter Agnes were residing in Rye at No.2 Sea View Terrace. 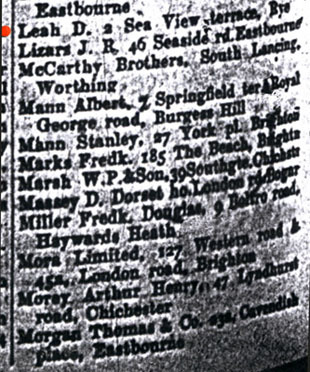 Although still employed as a metal worker, Dougald Wainwright Leah was listed as a professional photographer in local trade directories up until his death in 1932. The 1911 census records Dougald Wainwright Leah as a sixty year old "Street (sheet?) Metal Worker" at 2 Sea View Terrace, Rye. Dougald Leah died in Rye on 6th March 1932 at the age of 82. 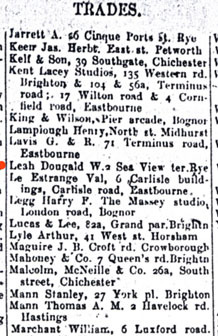 [ABOVE] Dougald Leah listed as a photographer in Kelly's Trade Directory of Sussex published in 1909. Dougald Wainwright Leah appeared as photographer in local directories up until 1932. 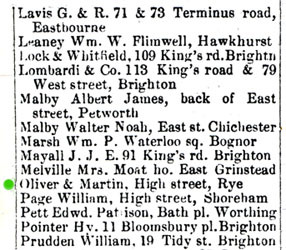 [ABOVE] Dougald Wainwright Leah listed as a photographer in Kelly's Trade Directory of Sussex published in 1924. 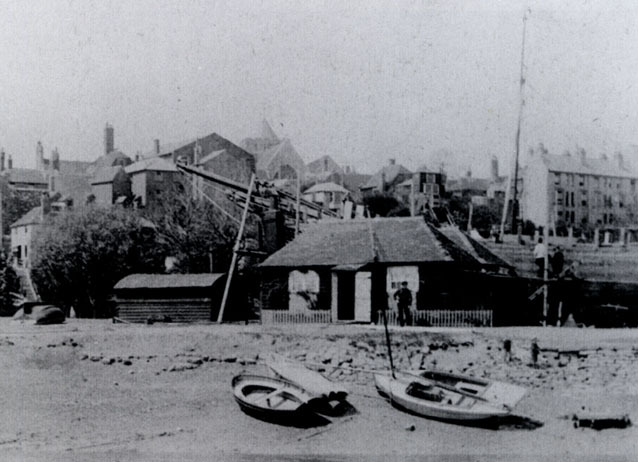 [ABOVE] A view of Rye from the River Rother showing the Old Ferryman's House on the riverbank. The tall row of buildings at the top right of the picture is Sea View Terrace, from where Dougald Wainwright Leah worked as a photographer between 1909 and 1932. 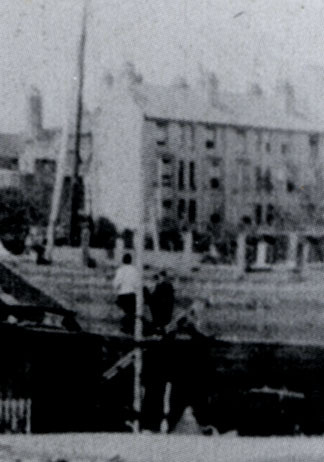 [ABOVE] A detail from the photograph on the left showing Sea View Terrace, where Dougald Wainwright Leah lived between 1909 and 1932. 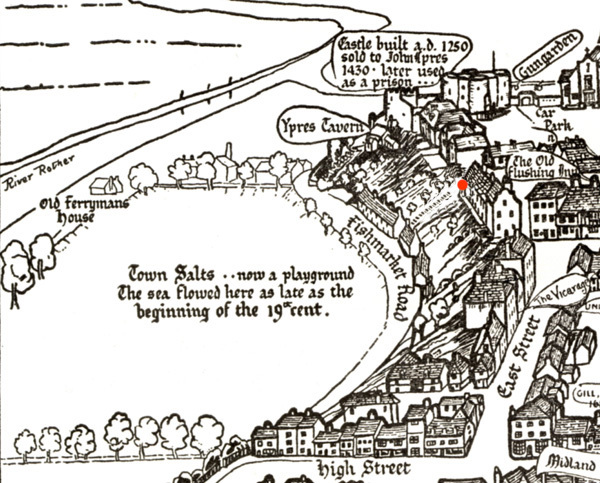 [ABOVE] A detail from Percy F. White's 1933 pictorial map of Rye, showing the location of 2 Sea View Terrace, the site of Dougald Wainwright Leah's home between 1909 and 1932. 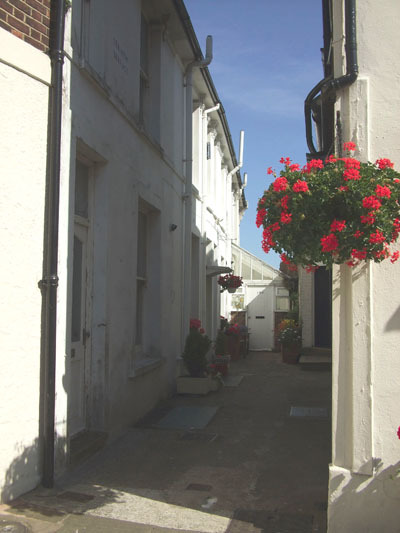 [RIGHT] Sea View Terrace, Rye, a recent photograph taken from the steps that lead down from East Street to Fishmarket Road. No. 2 Sea View Terrace, East Street, Rye, was the the location of Dougald Wainwright Leah's home between 1909 and 1932. [ABOVE] A real photo picture postcard by Dougald Wainwright Leah of 2 Sea View Terrace, Rye (1919). Inscribed in pencil on the reverse of the postcard is the caption "Impi Inglewood, Aug. Bank Holiday, 1919" The foot of the photographic image is blind-stamped "D. W. Leah, 2 Sea View Terrace, Rye"
[RIGHT] The passage which leads to Sea View Terrace, a recent photograph taken from Rye's East Street. The entrance to numbers 1 & 2 Sea View Terrace can be seen at the far end of the passageway. The Rye photographer Dougald Wainwright Leah lived at No.2 Sea View Terrace between 1909 and 1932. A photographic portrait studio had been attached to a tobacconists shop at 110 High Street, Rye since the mid-1860s when Robert Baggallay Thorpe (1834-1910) first began his career as a professional photographer. Around 1879, Robert Baggallay Thorpe sold his shop and photographic studio in the High Street to two tobacconists, James Oliver and George Martin. For a few years between 1880 and 1882, the two tobacconists operated the photographic studio under the name of Oliver & Martin. 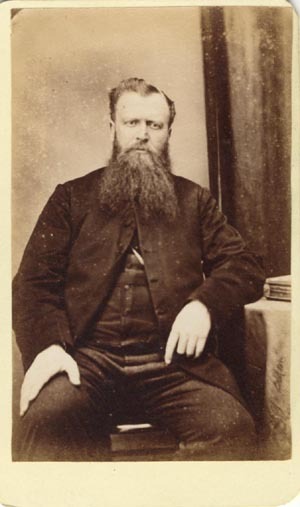 James Oliver was born in Rye around 1828. James Oliver's business partner, George Martin, was ten years older and originated from Ewhurst, a small village close to the border with Kent and about ten miles north of Hastings. When the 1881 census was taken, James Oliver and his business partner George Martin were living alongside each other in the High Street of Rye. Both men were bachelors. James Oliver, described as fifty-three year old tobacconist, rented out a room to a thirty year old unmarried butcher named Charles Robinson. George Martin , recorded on the census return as a sixty-three year old tobacconist, lived alone next door. James Oliver and George Martin were primarily tobacconists, but they continued to run the photographic studio at 110 High Street, Rye for the next few years. James Oliver and George Martin were tobacconists by trade and possibly employed a professional photographer to take portraits at their High Street shop. In 1881, a photographer named George Baker (born 1855, Castle Cary, Somerset) was lodging at a house nine doors away from Oliver & Martin's business premises in Rye's High Street and might have been hired by the two tobacconists to take portraits at No.110. In 1886, James Oliver died in Rye at the age of 58. Soon after James Oliver's death the photographic studio and tobacconist business at 110 High Street was sold to Joseph Sellen (c1835-1897). The studio at 110 High Street, Rye eventually closed around 1890. [ABOVE] A carte-de-visite portrait of a bearded man seated at a table, , photographed at the studio attached to Oliver & Martin's tobacconist's shop at 110 High Street, Rye. 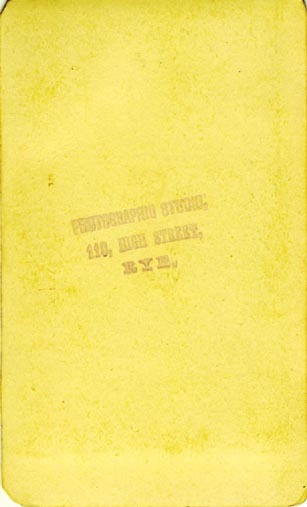 [ABOVE] The reverse of a carte-de-visite portrait produced around 1880 showing details of the photographic studio at 110 High Street, Rye, then owned by two tobacconists, James Oliver and George Martin. [LEFT] The firm of Oliver & Martin of High Street, Rye, listed as photographers in Kelly's Trade Directory of Sussex published in 1882. James Oliver and George Martin were tobacconists who owned a shop at 110 High Street, Rye, between 1879 and 1886. Attached to the tobacconists' shop was a photographic studio which had been established by Robert Baggallay Thorpe in the mid 1860s. In 1882, Oliver & Martin's business premises at 110 High Street, Rye, was the only place in Rye where a person could have a photographic portrait taken.